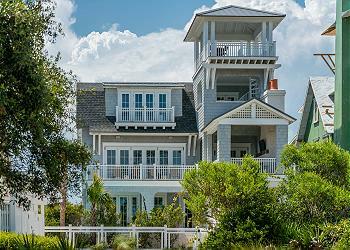 LOCATION: This home is 100 yards to the Gulf waters. DETAILS: 11 Compass Rose Way is an impeccable house that comfortably sleeps 14 people and boasts picturesque views of our white sand beaches and the Emerald Coast. 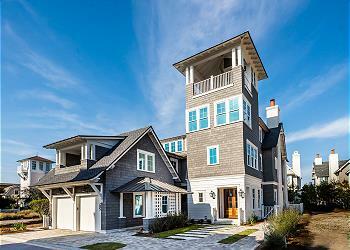 This spacious, and masterfully constructed, six bedroom, six and a half bathroom home is located in Watersound's Dune Ridge District. As you enter the property, you are welcomed by the beautiful, reclaimed-wood trimmed, foyer which leads to the common areas.This home is perfect for guests who wish to enjoy the breeze of the Gulf, even while they are at home, as there are indoor and outdoor cooking, dining and living areas. Inside, the living room has a couch, set of club chairs, an additional chair and a TV above the fireplace. The dining area has a wooden table with eight seats and the gourmet kitchen has stainless steel appliances, including a wine fridge, and an island with four bar stools. Outside, there are two screened-in common areas. The first has a large dining table with a bench on one side and five chairs around the other sides, sitting directly adjacent to the bonus cooking area which is highlighted by the large gas grill. The second area has a couch and set of club chairs around a TV that can also be viewed by those in the courtyard. One of the many highlights of the home is the beautiful pool and fountains. The pool and courtyard can be enjoyed by relaxing on one of the four layout chairs. To round out this stunning first floor, head back inside to the first of six bedrooms that is furnished with a queen bed and TV. Its connecting bathroom has a single vanity, shower and an additional access point from the hallway for guests who are gathering in the common areas. The second floor of the home has four bedrooms, including two masters, each with an ensuite bathroom. The first master, located just at the top of the stairs, has a king bed, TV, a pool view, and a distinguished bathroom with a double vanity, shower, tub, and walk in closet.he second master suite, located at the end of the floor, has a king bed, TV, club chairs, ensuite bath with a single vanity and shower-tub combo, and Gulf views from the private balcony that is furnished with two tall chairs. In between these suites are two additional bedrooms, both with king beds, TVs and single vanities. The one with the pool view has a shower and the other has a shower-tub combo. The third floor is a dream-come-true for any kid. It has a partial kitchen, two seating areas and sleeps four. The first is a large den with three comfortable couches and a TV and the second is a set of club chairs. There is also a TV in the dedicated playroom on this floor. A full bath with a double vanity and shower-tub combo serves the entire floor. Finally, a spiral staircase leads guests up to the oversized, wrap-around top deck. This was the family Christmas gift! Awesome home. Loved the porches, the pool, the location, and the three different stories where everyone had a room! A wonderful family together place! What a wonderful Christmas gift for you and your family! We agree completely that this home is in the perfect location and easily accommodates everyone! Thank you for staying with 360 Blue, we hope to see you again soon! We could not be more thrilled to hear how much you enjoyed your stay with us in Watersound! Thank you for staying with 360 Blue, we look forward to seeing you again soon! The house is so beautiful, comfortable & clean. It is close to the beach and pool and the view from the rooftop is gorgeous. The 360 Team is very accommodating and made everything easy and enjoyable!! We are so thrilled that you enjoyed your stay and your experience with 360 Blue! We agree that the view from the top floor is amazing! We hope to see you again very soon! 11 Compass Rose Way. A spacious home to spend 7 perfect weather days with 4 adults and 6 teenagers. The house is new, and has everything you need to enjoy quality family time. We had plenty of room to relax inside and poolside. Two screened in patios allow for great outdoor seating. Could have comfortably added another large family. Parking is a little tight. Access to the garage would be nice if you have more than 2 cars. A short walk to an active, but roomy beach. Beautiful clear blue water and white sand. Not much tide change and gentle waves if you have young children. The Beach club was a nice place to enjoy a healthy lunch menu. You are half way between two shopping and entertainment areas and The Hub is just around the corner. Very easy to walk or bike. 360 Service was great. Sent two emails. Both were answered in less than 10 minutes. Looks like the perfect beach day! We are so happy that you enjoyed your stay in this amazing home. We loved having you with us and look forward to having you back again soon!